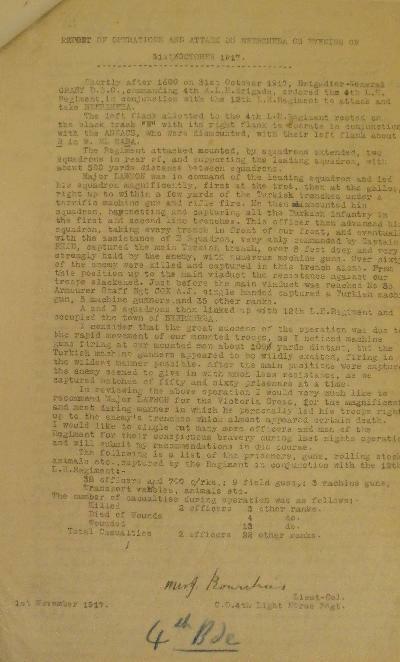 4th ALHR Beersheba Post Battle Report, 1 November 1917. After the victory at Beersheba on 31 October 1917, the Commanding Officer of the 4th Australian Light Horse Regiment, Lieutenant Colonel Murray William James Bourchier wrote his post battle summary which is transcribed below. Shortly after 1600 on 31st October 1917, Brigadier-General William Grant, D.S.O., commanding 4th A.L.H .Brigade, ordered the 4th L.H. Regiment, in conjunction with the 12th L.H. Regiment to attack and take Beersheba. The left flank allotted to the 4th L.H. Regiment rested on the black track “W” with its right flank to operate in conjunction with the Anzacs, who were dismounted, with their left flank about “B” in Wadi el Saba. The regiment attacked mounted, by squadrons extended, two squadrons in rear of, and supporting the leading squadron, with about 500 yards distance between squadrons. Major James Lawson was in command of the leading squadron and led his squadron magnificently, first at the trot, then at the gallop, right up to within a few yards of the Turkish trenches under a terrific machine gun and rifle fire. He then dismounted his squadron, bayoneting and capturing all the Turkish infantry in the first and second line trenches. This officer then advances his squadron, taking every trench in front of our front, and eventually with the assistance of “B” Squadron, very ably commanded by Captain Reid, captured the main Turkish trench, over 8 feet deep and very strongly held by the enemy, with numerous machine guns. Over sixty of the enemy were killed and captured in this trench alone. From this position up to the main viaduct and resistance against our troops slackened. Just before the main viaduct was reached No. 83 Armourer Staff Sgt Arthur John Cox single handed captured a Turkish machine gun, 5 Machine Gunners, and 35 Other Ranks. “A” and “B” Squadrons then linked up with 12th L.H. Regiment and occupied the town of Beersheba. I consider that the great success of the operation was due to the rapid movement of our mounted troops, as I noticed machine guns firing at our mounted men about 1,000 yards distant, but the Turkish machine gunners appeared to be wildly excited, firing in the wildest manner possible. After the main positions were captured the enemy seemed to give in with much less resistance, as we captured batches of fifty and sixty prisoners at a time. In reviewing the above operation I would very much like to recommend Major James Lawson for the Victoria Cross, for the magnificent and most daring manner in which he personally led his troops right up to the enemy's trenches which almost appeared certain death. I would like to single out many more officers and men of the Regiment for their conspicuous bravery during last nights operation and will submit my recommendations in due course.